This pasta is the ultimate trio: simple, quick, and delicious! It’s the type of dish that you can easily take to your office for lunch or can easily be whipped up after a long day of work. 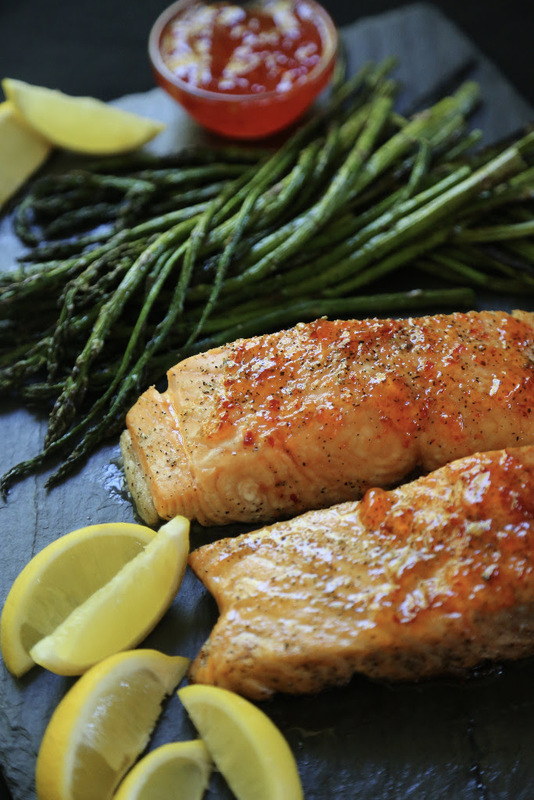 This sweet, spicy, savory apricot jalapeño preserve packs an incredible flavor into this light grilled fish dish. Serve alongside asparagus and you have yourself the ultimate summer meal! 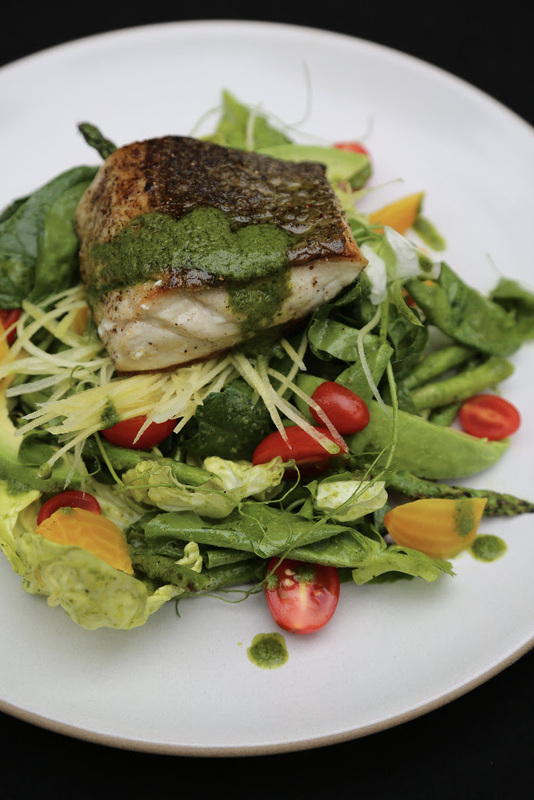 Monthly columnist Kendra Aronson of The San Luis Obispo Farmers’ Market Cookbook returns with an enticing salad with sea bass for National Salad Month. Enjoy! This mouth-watering sea bass tastes as good as it looks. The sweet pea tendrils and asparagus give a nod to springtime; while the beets, avocado, and garlicky basil dressing give you a hint that summer is just around the corner! “This month, Kendra contributes a bright, refreshing salad to be enjoyed come rain or shine. 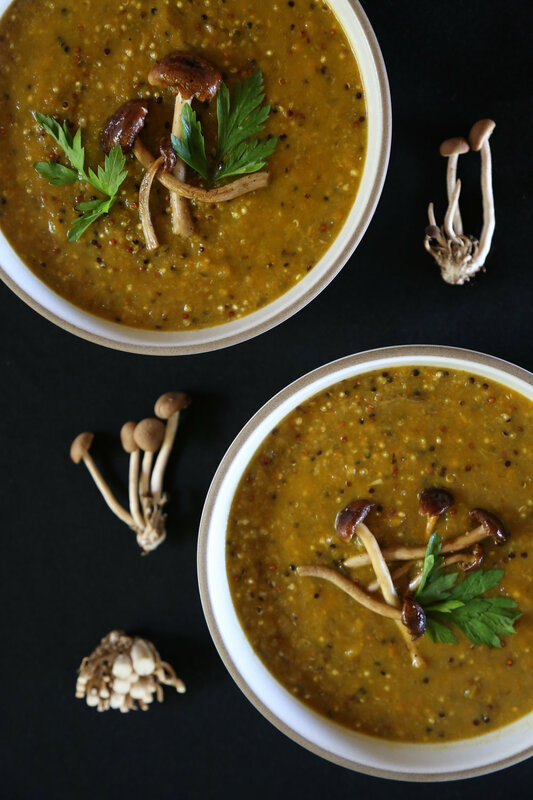 “This month, Kendra contributes a delicious soup recipe to enjoy on these (at last!) cold evenings. 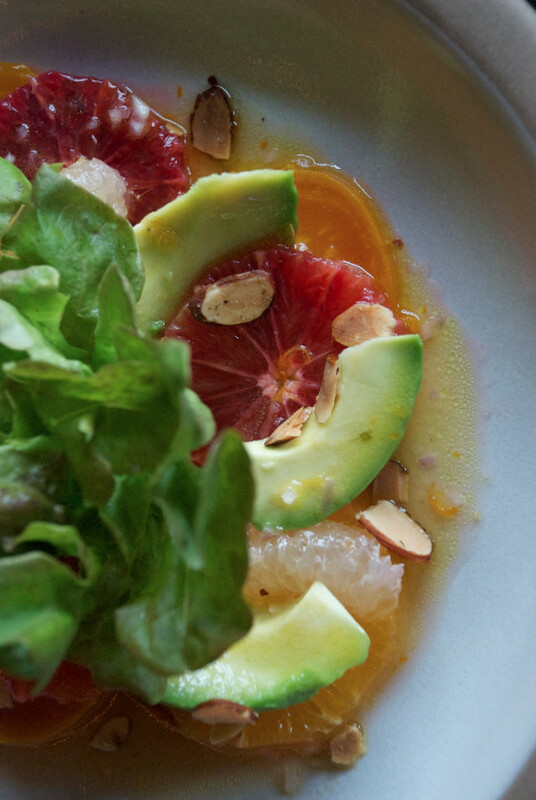 "KENDRA'S COLUMN" JANUARY 2018: Winter citrus salad with avocado, almonds, and radish"
“Kendra Aronson presents a delicious and seasonal Winter Citrus Salad with Avocado, Almonds, and Radish in her monthly column. Thanks, Kendra! 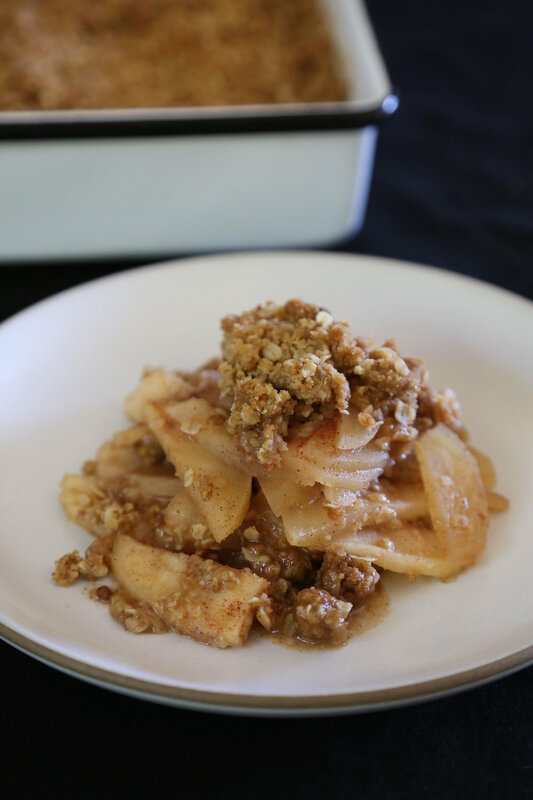 "Monthly columnist and The San Luis Obispo Farmers' Market Cookbook author Kendra Aronson contributes a beautiful and delicious recipe this month for "A Little Slice of Heaven" Apple Crisp. For a fun family outing, visit SLO Creek Farms during their u-pick season. Fill up your bushels with Braeburn apples, come home, bake this crisp, and enjoy the fruits of your labor! These Brussels sprouts sure do pack a punch! Between the garlicky aioli, vibrant lemon juice, and salty bacon, you will always have a hankering to make this easy comfort dish. "When Alice was finished and the crowd began to head upstairs to the cocktail hour, we lucky ones who could lingered in the green room. Alice was chatting with Traci, Gabriela and Liz when Kerry walked in with a woman with dark eyes and long wavy hair, holding a book. Alice took the book and began to leaf through it as Kendra began to quietly cry and I began to quietly tap away on my phone. Then Alice went in for the hug. Looks like I need to work on my focus more. Then again, I kind of think these shots are just perfect." "Be sure pick up a copy of The San Luis Obispo Farmers' Market Cookbook: Simple Seasonal Recipes & Short Stories from the Central Coast of California for your friends and family this holiday season! The cookbook features 196 pages of 60 seasonal recipes and 40 short stories. The recipes are organized by seasons (15 recipes per season) and are sub-divided into five categories: breakfast, light bites, lunch, dinner, and dessert (3 recipes per category). The latter part of the cookbook features short stories, interviews, and profiles of farmers, food artisans, and farm-to-table chefs. In the spirit of a creating a collaborative community-driven cookbook, the majority of the recipes are provided by the food growers and crafters themselves to showcase the true taste of the Central Coast. Flip to page 57 for Talley Farms' Napa Cabbage Wrap with Roasted Peppers and Chicken recipe and page 187 for Andrea Chavez's story on how she started the Fresh Harvest box program! Available for purchase at Talley Vineyards' tasting room and online. " "This month, we are excited to launch a monthly recipe from Kendra Aronson, the vision and voice behind The San Luis Obispo Farmers' Market Cookbook: Simple Seasonal Recipes & Short Stories from the Central Coast of California. Take it away, Kendra! 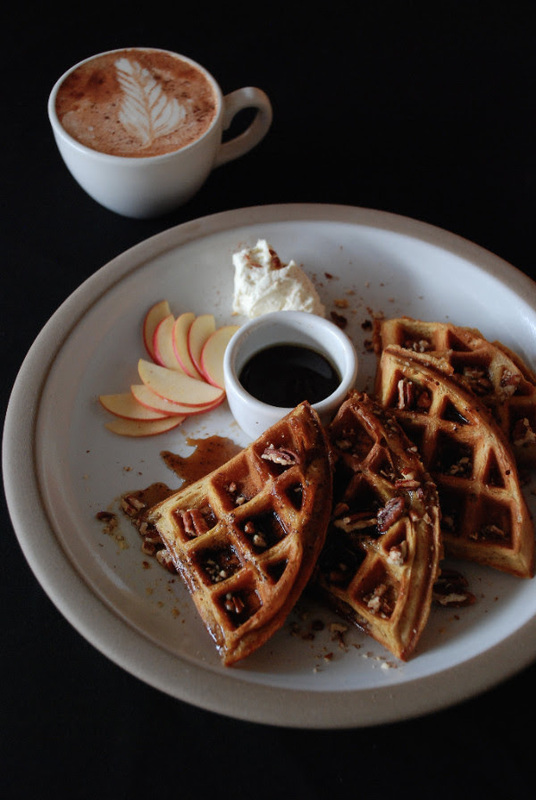 You officially know it’s fall when these pumpkin waffles re-appear on the menu of Sally Loo’s Wholesome Cafe. They are doused in brown butter syrup, cardamom mascarpone whipped cream, and topped with locally grown apples and toasted pecans. Yup, fall is here!" "We are pleased to announce that Kendra Aronson will be contributing monthly to Tomorrow Night at The Market, the Downtown SLO Farmers' Market newsletter. Kendra is the vision and voice behind The San Luis Obispo Farmers' Market Cookbook: Simple Seasonal Recipes & Short Stories from the Central Coast of California. Her enthusiasm (and endless energy) made it real—from the writing, recipe testing, and food photography, to the editorial design and self-publishing. Taking her dream from big idea to bound book took creativity and crowdfunding. In July 2015, Kendra launched a Kickstarter campaign and raised $26,714 in pre-order sales. She sold out of her first print run of 2,000 copies in just 20 days. Now in its third print run, Kendra’s cookbook has sold over 8,000 copies. She’s still in awe and grateful to every single supporter. Kendra's successful self-publishing journey has been featured on Girlboss, Food52, Radio Cherry Bombe, and the Being Boss Podcast. Plus, her cookbook has garnered the attention of famed, farm-to-table goddess Alice Waters (!). Check next week for Kendra's Column, where we'll feature a recipe from her famed cookbook. You can also follow her on Instagram at @kendraaronson." "When Kendra Aronson launched her Kickstarter-supported project to produce The San Luis Obispo Farmers' Market Cookbook, she called upon local chefs and farmers to contribute their favorite recipes, resulting in a true community cookbook. The collection dishes up seasonal flavors, a celebration of farm-fresh California ingredients and a personal look at the hardworking people behind the food. Paperback from Kendra Aronson Creative Studio. $35." "Kendra Aronson (Modern Languages and Literatures, '09) published a cookbook inspired by the San Luis Obispo farmers' market." "Weekend Getaway: 6 Must-Do Things in SLO CAL"
"Kendra Aronson will inspire you to get going on that creative project that’s stuck in your head. We chat about how she self published The San Luis Obispo Farmers' Market Cookbook and crowdfunded the whole project. Her first run of 2,000 copies of the cookbook sold in the first 20 days! Kendra talks about the elements that she wanted to include in this beautiful cookbook. We chat about Javier Magana, a San Luis Obispo farmer. 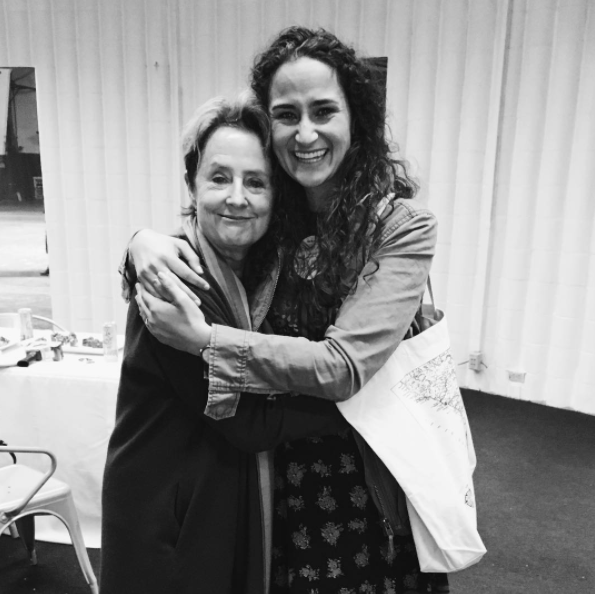 Kendra’s connection with Alice Waters. How we met at #FoodBookFair in NYC and Kendra gives us some of her New York City highlights from the trip. I made the Burrata Salad with Sweet Peas, Snap Peas & Sugar Peas from page 129 and Kendra tells us about Sally Loo’s Cafe where the recipe came from. I attempt to pry deets about her next cookbook out of her to no avail. Take a listen and get inspired, Kendra Aronson is a force of nature!" "Later we chat with Kendra Aronson, the food writer, photographer, and self-publisher of The San Luis Obispo Farmers’ Market Cookbook: Simple Seasonal Recipes and Short Stories from the Central Coast of California. After a successful Kickstarter campaign, raising $27,000, Kendra’s book caught the attention of retailers across California and even farm-to-table goddess Alice Waters. Kendra also runs her own creative studio and founded The Central Coast Creatives Club." "We have 20 farmers' markets every week—at least one every day, and as many as five on Saturdays. I love the Monday market in Baywood, the Thursday market in San Luis Obispo, and the Saturday market in Templeton. I'm a fan of bringing my reusable mason jars to the market to fill up on fresh juice and seasonal soups." "CHOOSE YOUR ADVENTURE IN SLO CAL"
"LIFE'S TOO BEAUTIFUL TO RUSH"
FOOD52 "5 Insider Tips for (Successfully) Self-Publishing That Cookbook You Dream About"
"In Part 1 of this mini series, I previously shared how design dictates everything and how to reverse engineer your production timeline based on your release date (plus 3 more tips!). Now it’s time to dive deeper into other important elements: cover design, recipe testing, proofing, campaigning, and marketing!" "Bring Novo Restaurant & Lounge home with you by making their delicious and fresh Avocado-Shrimp Spring Rolls. Check out the recipe below and then try them for yourself during Restaurant Month January 2017"
"San Luis Ranch: A Sustainable Land Plan that Protects Views, Preserves Agriculture and Nurtures Growth. San Luis Obispo is a farming community. This is our legacy. And most importantly, this is our future. Preserving 50% of the land as a working farm and open space, which protects the existing view corridor into SLO, and creates a new Agricultural Heritage Learning Center are just some of the ways that San Luis Ranch ensures that the agricultural heritage of SLO remains firmly planted. When we honor the legacy of our past, we can build upon its strength as a community, to house our citizens, nurture our growth and sustain our values, without ever changing the landscape." Read the full article → Beyond the #Girlbossmoment: Kendra Aronson self-publishes a super successful cookbook! '“I remember the first time I ever went to the downtown SLO farmers’ market. It was right before my first year at Cal Poly,” Aronson fondly recalled. “It was during WOW [Week of Welcome]. What I remember most distinctly were the strawberries—I was blown away. I’d never tasted strawberries that good before!” she said excitedly, as if it was happening all over again. "We are addicted to cookbooks at General Store PR. They make you feel hopeful. They tell a simple story that ends with people together, enjoying a meal (and maybe dessert!) Our customers often recommend books they love, and we also spend hours pouring over piles of new cookbooks each season. Sometimes the cover is enticing, but there aren’t enough pictures, or the recipes don’t make us want to clutter up the counters with piles of cilantro or a dusting of cornmeal. The San Luis Obispo Farmers’ Market Cookbook, with its striking portrait of fresh produce against a black background, delivers on every level. We met Kendra Aronson, its author, when she came to the store a few years ago to tell us about her plans. The end result is visually gorgeous, and the recipes make you want to grab that apron. We asked her some questions as we piled a few more of her books onto our cookbook table. " "Kendra Aronson (Modern Languages and Literature, ’09) is the writer, photographer, designer and self-publisher of The San Luis Obispo Farmers Market Cookbook: Simple Seasonal Recipes and Short Stories from the Central Coast of California. The book was released December 2015 and sold out in 20 days. Now in its second print run, the cookbook is stocked by more than 60 retailers in San Luis Obispo County and in all the California locations of Barnes & Noble." SLO TRIBUNE "CENTRAL COAST WRITERS CONFERENCE RETURNS TO SAN LUIS OBISPO"
"With a newly expanded roster of offerings, organizers of the Central Coast Writers Conference aim to attract writers, readers and other literati to San Luis Obispo later this week. Now in its 32nd year, the event, which runs Thursday through Saturday in San Luis Obispo, features 60-plus literary professionals sharing their insights via 85 classes and workshops, plus panel discussions, keynote presentations and more. It’s presented by Cuesta College Community Programs. As many as 400 people are expected to attend the conference next week, according to conference director Teri Bayus. That’s compared to about 250 conference goers last fall. This year, Bayus has added some nonfiction offerings, such as memoir writer Nahid Rachlin and cookbook authors Brigit Binns of Paso Robles and Kendra Aronson of San Luis Obispo. 'That’s a very underserved part of the writing community,' Bayus said." FOOD52 "The First Five Steps to Self-Publishing Your Cookbook"
"In December 2015, I self-published my first cookbook entirely from scratch: I did all the writing, photography, design, pre-order crowdfunding, marketing, and distribution. It was a lot of work, and a lot of fun. As I embark on creating my second book, I've been looking back at all I learned—here are just a few of tips I would share with anyone wanting to self publish (I have many more!)." "Our farmers’ market hero in the SLOcal space is Kendra Aronson. The writer and publisher of The SLO Farmers’ Market Cookbook, Kendra has compiled a collection of recipes – many by the folks in the community – to showcase the local ingredients that are in several signature dishes from Southern and Central California. By enjoying this box, you’ll also get to explore some of the dishes from Kendra’s stunning cookbook. When we share our cookbook secrets, we all grow that much closer to the beauty of local and less commercial, handmade and less machine manufactured, intimate and less impersonal. We support a local food economy with seasonal produce that’s best for our health and wellbeing. Who doesn’t want to support a food and farming community and culture that is this colorful, bountiful and delicious?" "Autumn is around the corner, and this box will put you in the midst of multiple colors and a change of palate. You’ll enjoy Brussel sprouts, butternut squash, leeks, mushrooms, tart green apples and pomegranates. And arriving just in time for a delicious preparation of the classic tri-tip meal are pinquito beans, a cross between a pink bean and a small white bean. Once you’re on the path to mastering this dish, there is no turning back. This scrumptious Santa Maria BBQ standard will turn any dilettante in the kitchen into an avid chef with a prize-winning meal for the ages." "Cheryl Sternman Rule talks Yogurt Culture, Kendra Aronson takes us on a tour of The San Luis Obispo Farmers’ Market Cookbook, Jeni Britton Bauer serves us up a double scoop of Jeni's Ice Cream." 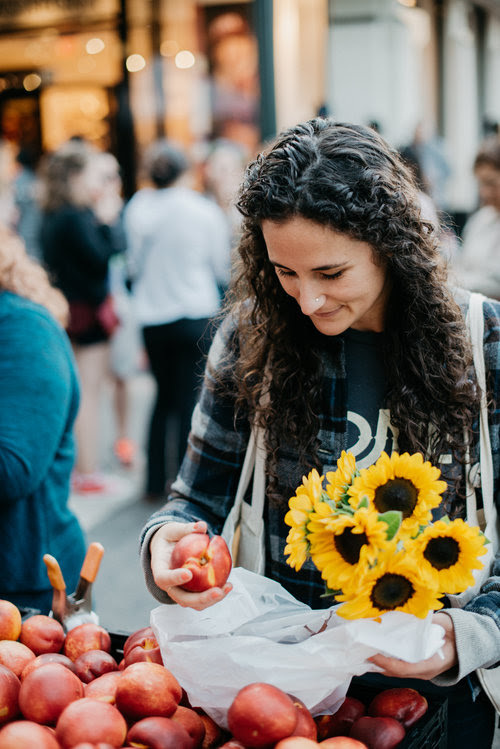 "Summer is in full swing, and so are our favorite markets. Around these parts, we are lucky enough to have the choice of shopping at a local farmers market or having a particular farm deliver a box of random goodies from their harvest, known as community-supported agriculture (CSA) harvest subscription. Both options contain the element of surprise: you just never know what you'll find from week to week. Figuring out what to do with cardoons three weeks in a row, or an entire bushel of apricots, can be a challenge to even the most seasoned chef. Thus, two new cookbooks that focus on seasonal farmers' markets and CSA produce are a huge help to our busting larders, especially this time of year. Let's begin with The San Luis Obispo Farmers’ Market Cookbook, written by the indefatigable Kendra Aronson. I've rarely met a more enthusiastic and proud author, and she should be. She wrote, photographed, designed, and published this gorgeous book all on her own. San Luis Obispo was once known for its vast cattle ranches, but a major drought in 1863 forced residents to look for other modes of income. They turned to dairy and agriculture, and the town and its surroundings have been known for great produce ever since. Filled with a wide range of recipes of specialities from the Central Coast, the book also includes favorites from local farmers, ranchers and chefs, as well as interviews with them in the back. For instance, Tami Righetti contributes her recipe for Sweet Yams with Brown Sugar Pecan Crumble. Her avocado ranch is then profiled in the rear, with a detailed history of her family's evolution on the farm. Shaun Behrens in the chef at Luna Red Restaurant. His Pistachio Crust Honeyed Goat Cheese Cheesecake is every bit as sublime as it sounds, with a citrus creme to top it off. The recipes are not complex; most are just one page long, which makes them approachable, and are written conversationally, as if by a friend. Which is surely how you'll feel about Kendra Aronson once you've worked your way through her wonderful homage to the farmers markets and people of SLO. The farmers market is held every Thursday from 6 to 9 pm on Higuera Street, between Osos and Nipomo Streets." "The package includes eight ounces of red abalone (complete with pretty shells), a disposable grill topper, Chardonnay Smoked Sea Salt from Pasolivo in Paso Robles, and two recipes, one for classic grilled abs and the other a crostini-based side dish by author Kendra Aronson, who wrote The San Luis Obispo Farmers’ Market Cookbook." "An extra bonus to complete this savory summer treat, True Myth has also included a special recipe from Kendra Aronson, local author of The San Luis Obispo Farmers’ Market Cookbook. Her Crostini with Sungold Tomatoes, Padrón Peppers, Grilled Zucchini, Fresh Brebis, and Spicy Pistachio Pesto is the perfect side dish to pair with the True Myth Chardonnay and abalone for a complete summer afternoon bite." "We’ve got some tasty, tasty news — this week, we’re celebrating 100 million dollars pledged to Food projects on Kickstarter. That’s $100 million from folks who’ve helped innovative cookbooks, new restaurants, food trucks, community spaces, gardens and farms, coffee shops, breweries, and other gourmand dreams come to life. Let’s revel in the goodness together. Join us as we gather ‘round the table to dig into these festive recipes from successful Kickstarter creators who know firsthand the amazing things that can happen with the help of an enthusiastic community." "Did you know there are 20 local Farmer’s Market throughout SLO County every week? At least one per day and as many as 5 on Saturdays? We are so so blessed. And Kendra Aronson, owner of Kendra Aronson Creative Studio and author of The San Luis Obispo Farmers' Market Cookbook knows it and wants to share it with the world. She wants to share with you the stories of our local farmers, chefs, restaurant and cafe owners who work tirelessly to support our wondrously plentiful food system here on the Central Coast. She wants to share with you amazing seasonal recipes created by these people that can help inspire you to shop locally, eat locally, and eat seasonally. She does it so well in her beautiful cookbook that I highly suggest you check out." KCBX "JOURNEYS OF DISCOVERY WITH TOM WILMER"
"Correspondent, Tom Wilmer visits with San Luis Obispo, California based author, Kendra Aronson about her new book, The San Luis Obispo Farmers’ Market Cookbook: Simple Seasonal Recipes & Short Stories from the Central Coast of California. The cookbook features 196 pages of 60 seasonal recipes and 40 short stories. The recipes are organized by seasons (15 recipes per season) and are sub-divided into five categories: breakfast, light bites, lunch, dinner, and dessert (3 recipes per category). The latter part of the cookbook features short stories, interviews, and profiles of farmers, food artisans, and farm-to-table chefs. In the spirit of a creating a collaborative community-driven cookbook, the food growers and crafters themselves showcase the true taste of the Central Coast. Kendra raised 27 thousand dollars on Kickstarter to fund her first print run of 2,000 copies—which sold out in just 20 days. Now in its second print run, the cookbook is stocked by more than 60 local retailers and is carried in all the California locations of Barnes & Noble. Writer, photographer, designer, and self-publisher Kendra Aronson also launched Creative Studio in 2014 to provide small businesses and fellow creative entrepreneurs with an array of services, including writing, photography, graphic design, and web design. Aronson is an enthusiastic 'Jane-of-all-trades' who is always dreamin’ up personal projects, work opportunities, and creative collaborations." 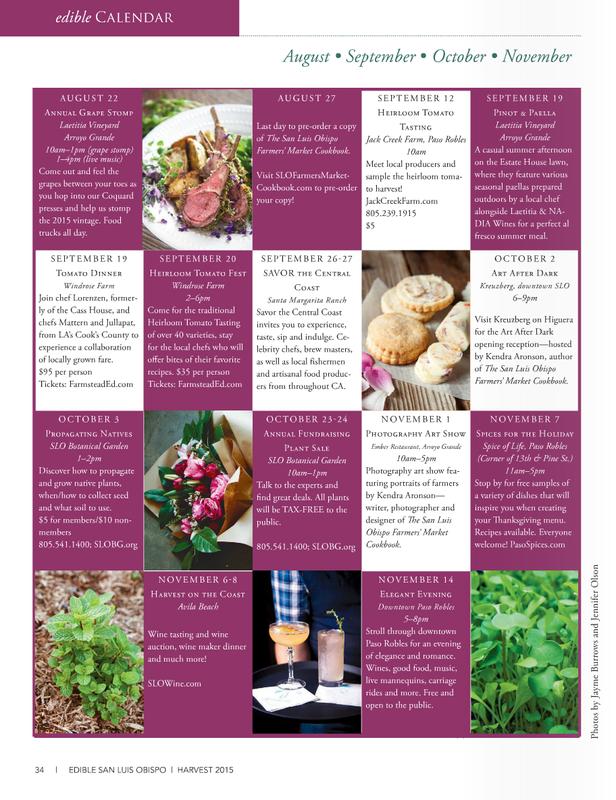 "Come meet the author of The San Luis Obispo Farmers’ Market Cookbook, Kendra Aronson. Join us for a beautiful day on the back patio with lots of friends, food, and fun! We will be sampling recipes straight from the book, which you may purchase at the event if you have yet to do so. Kendra will be happy to answer any questions and of course, sign your copy!" "Kendra is a dynamic woman involved in so many life-affirming actions. Besides her extensive portfolio, you may know her best as the author of The San Luis Obispo Farmers’ Market Cookbook .... Kendra also runs the Central Coast Creatives Club, where she organizes meet ups for like minded individuals wanting to discover new aspects of their area." "She grew up surrounded by food and worked part time as a server (working at Mama’s Meatball for a time in college), bartender, and even cheese monger. Aronson also dabbled in photography, but never thought to connect the two until she challenged herself to eat, drink, write, and photograph her way through the best bites and sips San Francisco had to offer when she was living up there. Today Aronson does freelance writing, photography, and graphic and web design for a bevy of clients, but her favorite gigs always involve food." —KVEC 920 AM "The Dave Congalton Show"
"Check out these two love letters to California farmers. Triple threat @kendraaronson produced the entire #slofarmersmarketcookbook by herself. And the Farmsteads book is by Sarah Henry and @erinscottstudio. Both books have great recipes, stories and pictures"
My husband , Shea Somma, and I were casted as "the farmers' market goers" for this tourism promo video! "Designed by Kendra Aronson—author of The San Luis Obispo Farmers’ Market Cookbook. Cookbooks and market map prints availabel for purchase at www.slofarmersmarketcookbook.com/shop." "November 9: 'Self-publishing The San Luis Obispo Farmers’ Market Cookbook from Scratch' with Local Author and Food Photographer, Kendra Aronson"
"Kendra Aronson, local author of The San Luis Obispo Farmers’ Market Cookbook: Simple Seasonal Recipes & Short Stories from the Central Coast of California will be signing and selling her book which makes for the perfect Mother's day gift! (Sunday May 8 is Mother's Day, don't forget!) Kendra featured Rutiz Farms in the cookbook and recently re-designed their website: www.rutizfarms.com. Kendra will be at our farm stand on Tuesday, May 3, from 2-6 p.m.and again on Friday, May 6, from 3 to 6 pm." "Not only does Fromagerie Sophie have one of the best cheese selections on the Central Coast, they also have San Luis Obispo’s favorite cookbook. We can’t help but feel like we’re casually strolling the streets of Paris when we step into this delightful local shop. Included in this gift basket is The San Luis Obispo Farmers’ Market Cookbook: Simple Seasonal Recipes & Short Stories from the Central Coast of California signed by author Kendra Aronson. This is one cookbook that doesn’t stay on store shelves for long (it sold out over the holiday season)." 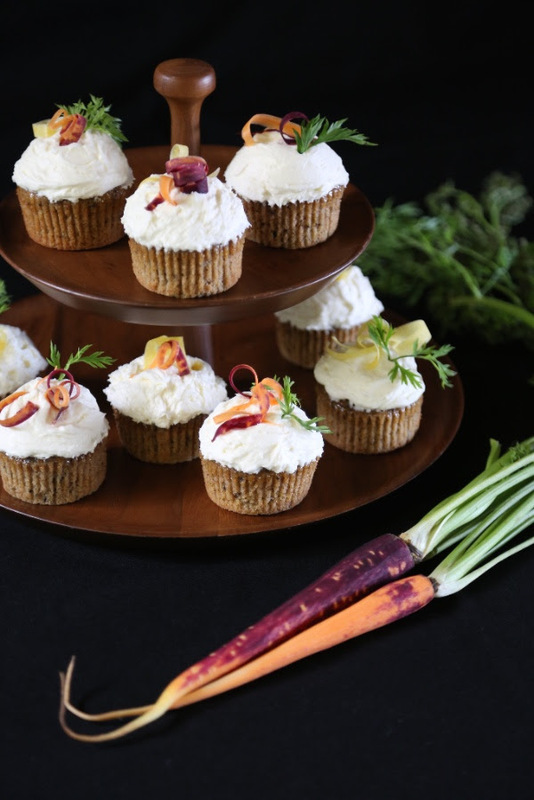 "Gather with us at the Santa Margarita Library to meet Kendra Aronson—the writer, photographer, designer, and self-publisher of The San Luis Obispo Farmers’ Market Cookbook: Simple Seasonal Recipes & Short Stories from the Central Coast of California. Kendra and Guy Rathbun will discuss her book, recipes, and local stories. "Ready to enjoy the finest wines and most delectable recipes San Luis Obispo has to offer? Kendra Aronson, author of San Luis Obispo Farmers’ Market Cookbook, will be here Sunday, April 24 from 1PM-4PM signing copies! Meet Kendra, sip wine, and purchase a specially priced market tote, cookbook and wine bundle featuring our Fleur de Edna Chardonnay. The perfect Mother's Day gift!" "Have you seen The San Luis Obispo Farmers’ Market Cookbook? It's a beautiful book worth stopping in to see. It makes a great gift too!" "I highly suggest you check out this interview that details Kendra’s journey from Cal Poly student to San Francisco cheesemonger, and then her return to San Luis Obispo and her transition into the creative design world. She has married her love of food and design into the beautiful San Luis Obispo Farmers’ Market Cookbook, which can be purchased here and was released last year in 2015. I also highly suggest reading this interview as a source of inspiration for any creative entrepreneurs or entrepreneurs within any industry for that matter. Kendra’s can-do attitude is nothing short of impressive." 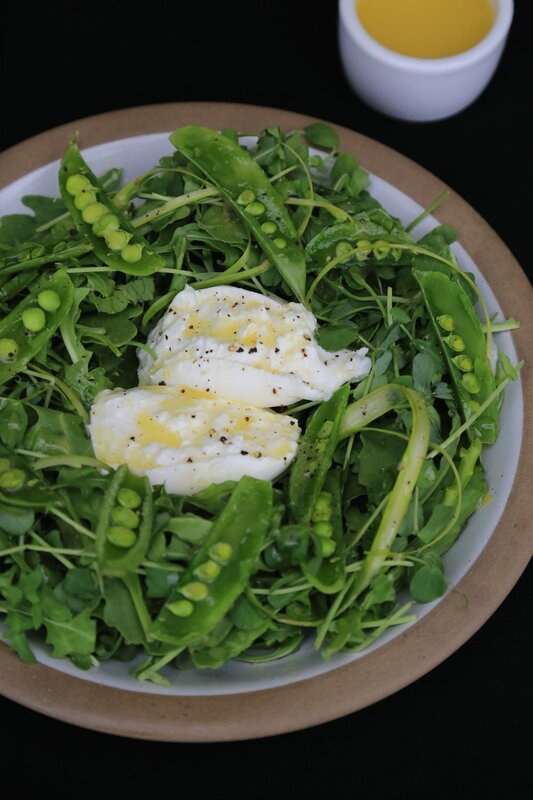 "Burrata Salad with Sweet Peas, Snap Peas, and Sugar peas from The San Luis Obispo Farmers’ Market Cookbook; recipe by Jen Manuele of Sally Loo's Wholesome Cafe. " "At the ripe old age of 28 (and three-quarters) Kendra Aronson has already checked a box on her life-goals list. Last year after interviewing, writing, photographing, editing, designing, marketing, social media-ing and hosting a successful crowd-funding campaign, she published The San Luis Obispo Farmers Market Cookbook. The years-in-the-making project had a stellar release that resulted in a second print run. The proprietress of Kendra Aronson Creative Studio recently took off all the hats that a solopreneur wears and talked about Leslie Knope, saying 'yes' and asking chefs for their recipes." "With no prior knowledge of design, she studied every book, website, and attended every workshop she could to learn the ins and outs of photography, design, and writing. In 2014 Kendra started her own creative business, Kendra Aronson Creative Studio. From there she tackled her dream to create a cookbook about the vastly loved farmers' markets on the Central Coast, called the San Luis Obispo Farmers Market Cookbook With the help of local farmers and chefs, Kendra curated a local guide to every farmers' market in SLO County with seasonal recipes, interviews, and short stories about the familiar faces that line the rows of farmers' market stalls." "I found this recipe from Sarah Matthews of Talley Farms in my San Luis Obispo Farmers’ Market Cookbook. Sarah is the resident chef at the Talley Winery and Farm. Her recipe for Napa Cabbage Wraps with Roasted Peppers & Chicken creates a stunning dish and perfect finger food for parties. It is also great for lunch or dinner at home and is easy to adapt with other ingredients. You can use an array of different vegetables, sauces and garnishes and vary the style of the dish accordingly." Read full article → Tired of Unhealthy Party Food? Serve a Tray of these Tasty Cabbage Wraps! "Aptly named, 'Mind-Blowing Milk-Braised Pork', this dish was sublime! The caramelized crispy bits on the outside were like candy and the meat was so tender, I was barely able to slice it. It was definitely mind-blowing!" Read full article → Braising in Milk Creates a Mind-Blowing Meal! "These cookies are quite a show stopper and even 'I' was able to make them look professional! Seeing that the bakery side of cooking is not my forte, I was a bit worried about pulling it off. After looking at the gorgeous photo in the cookbook showing off their glamour and style, I wasn’t sure if my results would be worthy enough. Much to my surprise, my cookies turned out both delicious and beautiful too!" "I’ve been working my way through the recipes in The San Luis Obispo Farmers’ Market Cookbook and I’m really enjoying it! There are some very talented chefs on the Central Coast of California and it is illustrated in the recipes they have contributed in this beautiful cookbook. I am also loving reading the short stories that showcase the chefs and local businesses who are featured in the book." "It was a delight to receive my copy in the mail last December. Kendra’s book is full of life, beautiful photographs, inspiring stories and delicious recipes from local farmers and chefs around SLO county. The cookbook is a must-own, not only for SLO natives, but for anyone passionate about cooking seasonal dishes with locally produced ingredients." "Ten Talks is an inspirational live event about becoming your own boss and creating freedom in your life. Details: ten local speakers will give ten minute talks each; tickets costs ten bucks and ten percent goes to charity." "Cal Poly graduate Kendra Aronson (Modern Languages and Literatures, '09) believes that the food you eat connects you to a long line of individuals who grow, produce and cook that food. This connection—if you know where your food comes from—is what enriches the culinary experience. Aronson forged that connection for others through her new cookbook, which fully immerses readers in the farms, farmers and chefs who grow and prepare food on the Central Coast—the community that helps make San Luis Obispo special. 'I just love that we live in such a rich agricultural area where you can literally shake the hand that feeds you,' Aronson said. For her, building friendships and becoming connected with the community starts through the taste buds. During her time studying modern languages and literatures at Cal Poly, the local farmers markets introduced her to the value and benefits of natural produce." "Local College of Liberal Arts grad Kendra Aronson (B.A., Modern Languages & Literatures, '09) is the writer, photographer and designer behind the San Luis Obispo Farmers' Market Cookbook. Launched on Kickstarter in July, 2015 Aronson's creation sold out in just 20 days and is now on its second run. The cookbook features 60 seasonal recipes and 40 short stories, plus interviews and profiles of local farmers and chefs, many of whom also provided the recipes included in the book." "Farmers still need our support, no matter the season. As Kendra Aronson, the writer and photographer behind The San Luis Obispo Farmers' Market Cookbook put it: 'Despite the downpours, you've got to make the trek to the market. Support your local farmer—both in moral support and financial support. Showing your dedicated loyalty year-round means the world to them. Embrace the weather and make it an adventure! The meal you make at home will taste infinitely better because you made the trek and braved the weather to the farmers' market, I promise.'" "This salad utilizes every part of the citrus including the zest, juice and fruit segments. The buttery flavor of the lettuce and the creamy avocado offer a nice balance for the citrus. The added crunch of the almonds and radishes add the finishing touch. It was the perfect end to my first day and left me feeling healthy and satisfied." "Given the striking visuals of her 196-page 'SLO Farmers’ Market Cookbook,' it’s hard to believe that—by her own admission—Kendra Aronson 'was not a writer, photographer or graphic designer' when she started the project some three years ago." "One of my favorite holiday gifts so far this year is The San Luis Obispo Farmer’s Market Cookbook! Written by Kendra Aronson, it is a compilation of stories and recipes from local farms and restaurants on the central coast of California. Aside from the tantalizing recipes, the pages are filled with enticing photographs that are sure to make your mouth water!" "A FEW OF OUR FAVORITE THINGS: We think these local favorites make the perfect gifts and stocking stuffers that everyone is sure to love this holiday season! SLO Farmers’ Market Cookbook: a community-driven cookbook featuring seasonal recipes." "Join us here at SLO Natural Foods Co-op for a book signing with local author Kendra Aronson on Friday, December 18th from 4 PM to 6 PM. Kendra’s book, The San Luis Obispo Farmers’ Market Cookbook, is a culinary tour of the Central Coast with 60 seasonal recipes, short stories, and interviews with local farmers and restaurateurs. Copies are selling fast —don’t miss out!" "IT'S HERE! The San Luis Obispo Farmers' Market Cookbook is out and you can get your copy! Author Kendra Aronson received recipes from many of our local farmers, tested them, interviewed the farmers and has just published her first cookbook. Sarah Matthews our own chef at Talley Farms and Talley Vineyards created a Napa cabbage recipe that is included. The cookbook is designed with recipes in the front and stories of our local farmers towards the back." "The Farmers' Market Cookbook is now available for purchase! Check out dozens of delicious recipes from Chefs around SLO County, including Chef Ben Richardson, Chef Shaun Behrens (Luna Red), and Chef William Ouderkirk (Robin's Restaurant)." "The Farmers' Market Cookbook is now available for purchase! Check out dozens of delicious recipes from Chefs around SLO County, including Chef Shaun Behrens, Chef Ben Richardson (Novo), and Chef William Ouderkirk (Robin's Restaurant)." "With the holiday season quickly approaching, the yearly stress of gift giving begins. But don’t worry… we’ve got you covered with nifty gifts ideas, unique to SLO. Whether you’re looking for a hostess gift or planning presents for the holidays, we’ve got a wide range of ideas for everyone on your list! FOODIES: San Luis Obispo Farmers’ Market Cookbook contains 60 seasonal recipes and 40 short stories from local contributors such as Big Sky Café, Mama’s Meatball, Sally Loo’s, Novo and more. Made possible by Kickstarter, this is a truly one-of-a-kind Central Coast find." "Local writer, Kendra Aronson, will be at the farm stand this Friday (December 4, 2015) selling and signing her newly published book. The San Luis Obispo Farmers' Market Cookbook: Simple Seasonal Recipes & Short Stories from the Central Coast of California features 60 beautiful recipes and 40 short stories on local farmers, food artisans, and farm-to-table chefs in SLO County. Rutiz Farms is featured in the book, as well as Jerry's Mint Tea recipe. The books are $35/copy and make great holiday gifts!" "Book launch for SLO Farmers' Market Cookbook by Kendra Aronson. Join us December 3rd 5:30-7:30 p.m. as we celebrate Kendra's new cookbook at the General Store! Enjoy some light bites while Kendra stops by the store for a book signing. Just in time for the holidays!" "We are so pleased to host Kendra Aronson for a pop-up shop and book signing featuring her newly released SLO Farmers' Market Cookbook. Come chat with Kendra, taste some local wines (a rarity here at The Station), and sample some fantastic olive oil from Olio 23." "The restaurant will hold a book signing for the local author of The SLO Farmers' Market Cookbook, Kendra Aronson, on December 12 from 11 a.m. to 1 p.m. SLO Provisions, located at 1255 Monterey Street in SLO." "Book signing with Kendra Aronson (Farmers' Market Cookbook) Dec 3"
"Kendra Aronson (Modern Languages and Literatures, ’09) is the writer, photographer, designer and self-publisher of “The San Luis Obispo Farmers’ Market Cookbook: Simple Seasonal Recipes & Short Stories from the Central Coast of California.” The cookbook is inspired by and showcases the food growers and farm-to-table chefs of San Luis Obispo County. Learn more at slofarmersmarketcookbook.com." "Aronson is a local artist who created The San Luis Obispo Farmers’ Market Cookbook." 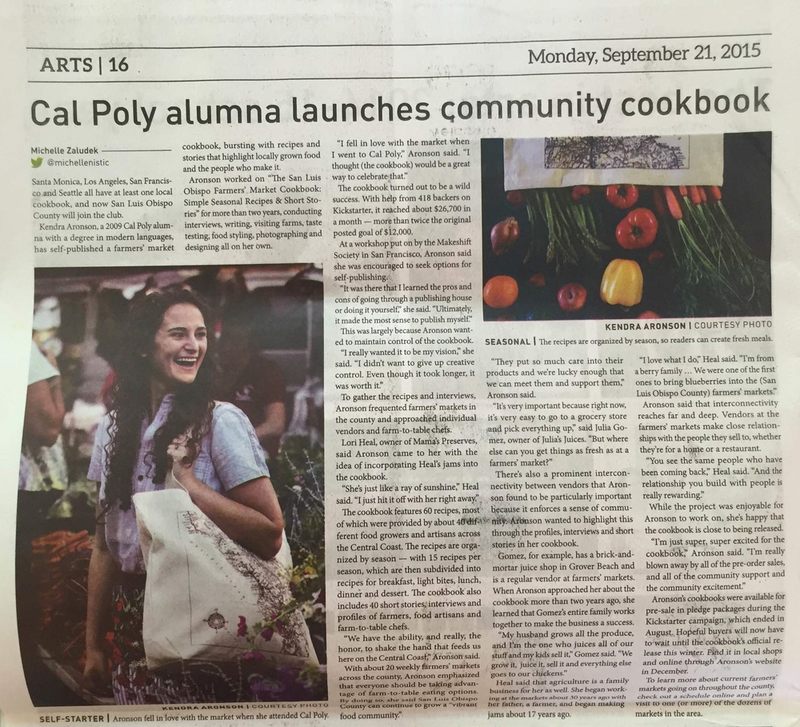 MUSTANG NEWS "CAL POLY ALUMNA LAUNCHES COMMUNITY COOKBOOK"
"To gather the recipes and interviews, Aronson frequented farmers’ markets in the county and approached individual vendors and farm-to-table chefs. The cookbook features 60 recipes, most of which were provided by about 40 different food growers and artisans across the Central Coast. The recipes are organized by season—with 15 recipes per season, which are then subdivided into recipes for breakfast, light bites, lunch, dinner and dessert. The cookbook also includes 40 short stories, interviews and profiles of farmers, food artisans and farm-to-table chefs. “We have the ability, and really, the honor, to shake the hand that feeds us here on the Central Coast,” Aronson said. “They put so much care into their products and we’re lucky enough that we can meet them and support them,” Aronson said. "Kendra Aronson set out to self-publish The San Luis Obispo Farmers' Market Cookbook: Simple Seasonal Recipes & Short Stories from the Central Coast (December 2015; slofarmersmarketcookbook.com) in the spirit of creating what she calls "a community keepsake that will inspire folks to shake hands with their SLOcal farmers." The compilation of recipes includes stories and interviews from Central Coast farmers, purveyors, and chefs such as Chris Kobayashi of Artisan in Paso Robles and Brian Collins of Ember in Arroyo Grande." "Kendra launched a Kickstarter campaign in late July with the goal to raise seed funding to partially pay for the publishing of the book. She reached that goal on August 5 and has continued her push to help further fund the production. The Kickstarter campaign features incentives for people who pledge a certain amount of money to help Kendra reach her goal, including: signed copies of the cookbook, a hand-cooked meal by Kendra, a tote bag, or a handwritten thank you card. Kendra has already met her $12,000 goal, but she isn’t stopping there. Join Kendra on her mission to cover the complete cost of her cookbooks’ production, support local businesses, and get your hands on some farm-to-table recipes in the process!" —Visit SLO's "Live Like a Local"
AUGUST 27 "Last day to pre-order a copy of The San Luis Obispo Farmers' Market Cookbook. Visit slofarmersmarketcookbook.com to pre-order your copy! " OCTOBER 2 "Visit Kreuzberg on Higuera (downtown SLO) 6–9 p.m. for the Art After Dark opening reception—hosted by Kendra Aronson, author of The San Luis Obispo Farmers' Market Cookbook." NOVEMBER 1 "Photography art show at Ember Restaurant (Arroyo Grande) featuring portraits of farmers by Kendra Aronson—writer, photographer, and designer of The San Luis Obispo Farmers' Market Cookbook." "Here's a project that will remind you of home, or SLOme as the young alumni like to call it...a SLO Farmers' Market Cookbook! 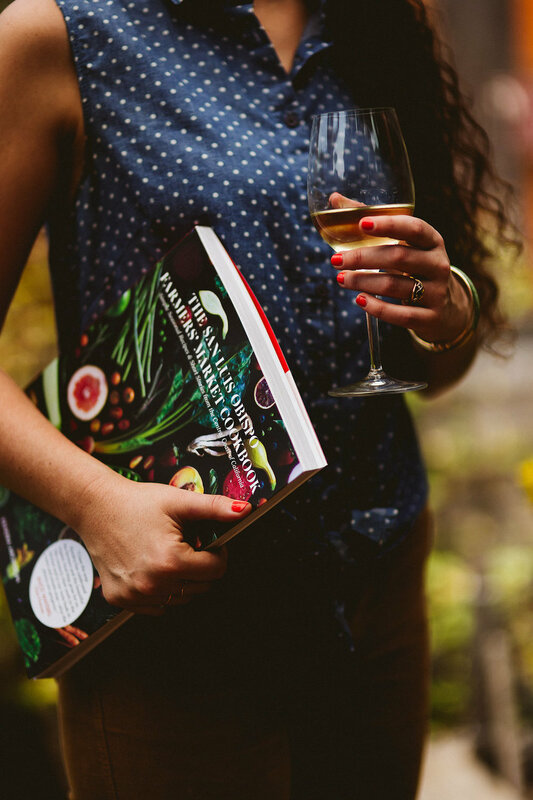 OF COURSE this was written by one of our own—alumna Kendra Aronson (Modern Languages & Literature '09)"
"Edible San Luis Obispo is proud to be part of the launch of a great Kickstarter campaign for The San Luis Obispo Farmers' Market Cookbook. Kendra Aronson has put together a very 'loving the local' cookbook of fresh-from-the-farmers'-market recipes. If all goes accordingly for the very organized Kendra, the cookbooks will be ready for the holiday season. Pre-order yours today, along with a farmers' market map and tote bag." KRUSH 92.5 "A QUICK BITE WITH DAVID WILSON"
"Daily 15-minute radio show on all things food, heard throughout the Central Coast at noon and 9pm Monday-Friday on The Krush 92.5 FM, we try foods from around the world and around your corner...David talks with Kendra Aronson about her Kickstarter campaign to fund her beautiful SLO Farmers Market Cookbook." 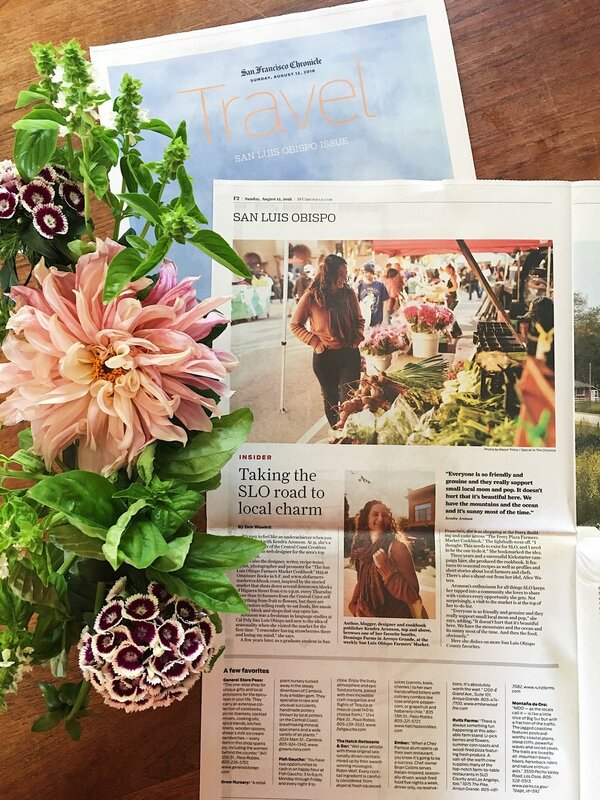 "Writer, photographer designer, self publisher and all around engaging Kendra Aronson’s San Luis Obispo Farmers’ Market Cookbook is moving closer to reality. Her Kickstarter campaign drive has attracted 228 contributors and surpassed its $12,000 funding goal. The campaign runs until August 27. Order a copy (or two or three) of the gorgeous cookbook that makes a great gift and helps a dream come true." Foodie Friday with SLO Farmers' Market Cookbook creator Kendra Aronson and KSBY's Healthy Living advocate and Daybreak anchor Keli Moore. "Local writer, photographer and designer Kendra Aronson launches Kickstarter campaign to fund self-publishing printing costs of SLO Farmers’ Market Cookbook. To help make this cookbook a tangible reality, please visit slofarmersmarketcookbook.com to pledge your support." 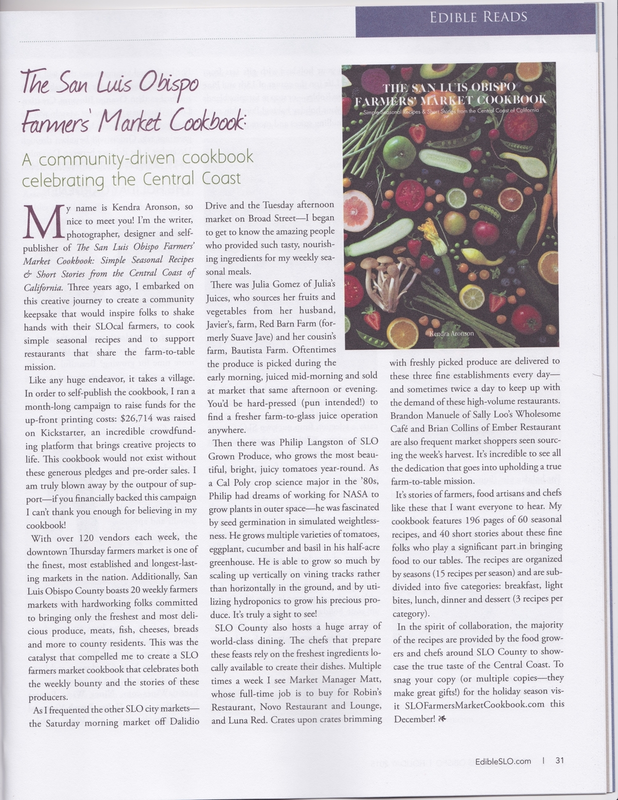 "We are very happy to be contributors to Farmers' Market Cookbook: Simple Seasonal Recipes & Short Stories from the Central Coast of California. Please join us in helping local author Kendra Aronson with her Kickstarter campaign to get this fantastic cookbook produced!" "Get to Know SLO is a San Luis Obispo radio show that focuses on the local culture of SLO. 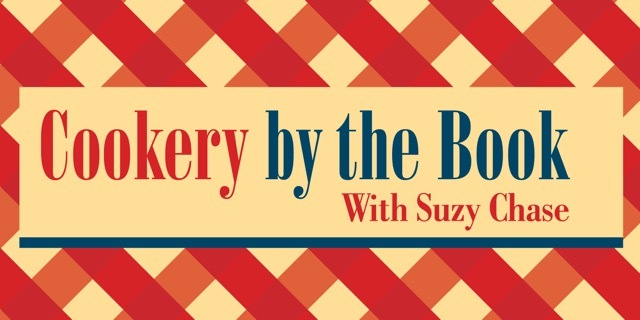 Hosted by Karen and Connor it features local news, music, events, and all things San Luis Obispo. You can listen live Wednesdays from 7 to 9 AM at kcpr.org and 91.3 FM." "We are very happy to be contributors to the SLO Farmers' Market Cookbook: Simple Seasonal Recipes & Short Stories from the Central Coast of California. Please join us in helping local author Kendra Aronson with her Kickstarter campaign." The San Luis Obispo Farmers' Market Cookbook: Simple Seasonal Recipes & Short Stories from the Central Coast of California. This unique cookbook features 196 pages filled with 60 seasonal recipes for breakfast, light bites, lunch, dinner, and dessert, plus 40 entertaining short stories. Kendra's goal is to raise twelve thousand dollars by August 27th to cover the up-front printing costs. Kickstarter is an online funding platform to help bring creative projects to life—offering rewards to supporters in exchange for their pledges. Kickstarter is also "all-or-nothing", which means 100% of her financial goal must be met in order to move forward with the project. To make this locally-based cookbook a tangible printed reality, please visit slofarmersmarketcookbook.com today to pledge your support! That's sloslofarmersmarketcookbook.com." "On any given day, you’ll find the curly-haired writer, photographer, and self-publisher stooped over the cukes or heirloom tomatoes, smiling wide and gabbing with farmers about the fruits of their labors. Just look for the DIY “farmers’ market” tote bag slung over her shoulder, showing a geographical map of each market. Yes, she’s actually a farmers’ market super fan. It’s this wild fandom that inspired Aronson to create the SLO Farmers’ Market Cookbook, a colorful collection of simple seasonal recipes and short stories. This week, she launched a Kickstarter campaign for the project, which is completely finished save for the pesky “publishing” part. Aronson hopes that local people will throw down a few bucks to support a local book that—in turn—supports local ranchers, growers, chefs, and restaurants. Can you get more local than that? For more information on the 'SLO Farmers’ Market Cookbook' and its multi-tasking, photographing, produce-loving author, visit slofarmersmarketcookbook.com. There you will also find the link to her Kickstarter campaign, so check it out if you want to see the project come to life. Backers will snag one of those sweet farmers’ market tote bags as well as the book itself." "The cookbook features 196 pages of 60 seasonal recipes and 40 short stories, interviews, and profiles of farmers, food artisans, and farm-to-table chefs. In the spirit of a creating a collaborative community-driven cookbook, the majority of the recipes are provided by the food growers and crafters themselves to showcase the true taste of the Central Coast. Her goal is to raise $12k by August 27 to cover the up-front printing costs through the use of Kickstarter." 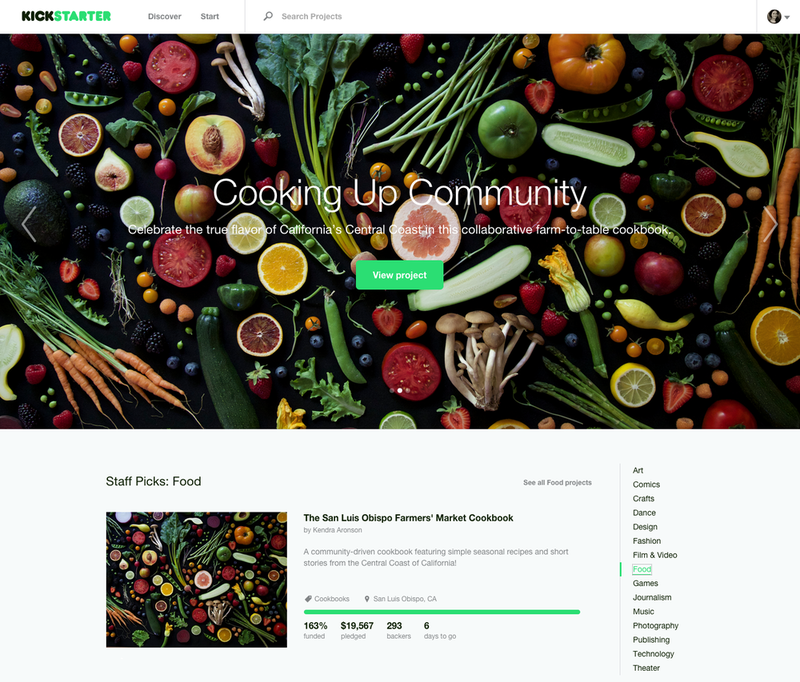 (out of 500 live Food projects on Kickstarter)!!! "Aronson’s goal is to raise $12k by August 27 to cover the up-front printing costs. Kickstarter is an online funding platform to help bring creative projects to life; financial supporters who back Kickstarter projects are offered rewards in exchange for their pledges. Rewards for the SLO Farmers’ Market Cookbook Kickstarter campaign include pre-orders of the cookbook, market tote bags, market maps, and more. Kickstarter is an all-or-nothing funding platform. To make this cookbook a tangible printed reality please visit slofarmersmarketcookbook.com to pledge your support." "After watching this very well made video about Kendra Aronson and her admirable project, I wanted to give her my support. Check it out and see if you, too, feel it’s a worthy cause! You can see why I was so happy to be able to support Kendra in her brilliant endeavor that helps our SLO County Farmers’ Markets, restaurants, and the chefs who embrace farm-to-table cuisine! Here’s the link to the video with details about the project, and links so you can pledge your support and/or pre-order the cookbook! 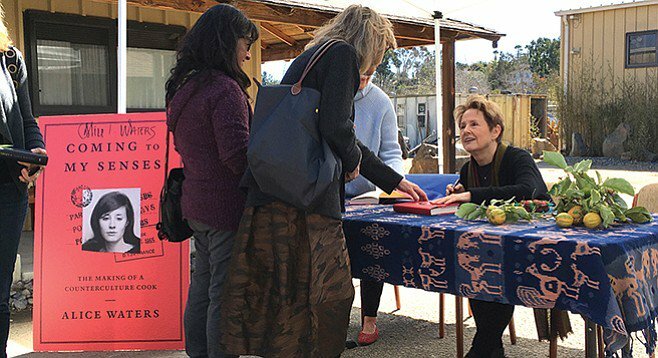 "Our local writer, photographer, and designer—and Ruby Crew alum!—Kendra Aronson launched her Kickstarter campaign TODAY to fund self-publishing printing costs of her SLO Farmers’ Market Cookbook!!! Get a preview of what's inside below—then don't forget to pledge support while gaining some great rewards, too!" "It’s peak farmers' market season and there’s a greater variety of fruits and vegetables than really any other time of the year. Yet we’re pretty spoiled here on the Central Coast, with high quality produce all year round. Jordan Bell is joined in the studio by Kendra Aronson who is preparing to share many of the aspects of the several farmers markets on the Central Coast. Aronson is a local writer, photographer, designer and soon-to-be self-publisher of The San Luis Obispo Farmer’s Market Cookbook." "The SLO Chamber welcomes new member, Kendra Aronson Creative Studio with a ribbon cutting ceremony. Launched in 2014, Kendra Aronson Creative Studio provides small businesses and creative entrepreneurs with an array of services including; writing, photography, and design." "Kendra Aronson is the author, photographer, and designer of The San Luis Obispo Farmers' Market Cookbook; support her Kickstarter campaign July 27–August 27." "This editorial directory is dedicated to our partners. A well-curated and diverse 'classifieds' section comprised of creatives that are supporting Trouvé Volume 03 and what we stand for. These individuals are passionate about what they do, and are making the world a little more handmade, and a little more inspiring along the way. With our deepest thanks and our full recommendation, here is true creativity found." "One of our sweet Ruby Crew members has been working 'round the clock on her SLO Farmers' Market Cookbook—and this last week celebrated her own birthday by launching her online shop! As the book is set to publish the end of this year, be privy to her creative teasers with a SLO farmers' market tote bags, letterpress market maps, and thank you cards. We are so proud and excited to see another one of our Crew exploding into their passions, check out these goods and make sure to snap some swag at her online shop. Hip, hip hooray for Kendra!""